Saturday night my coworker’s brother arrived. A few of us met up with Sejun, our Korean friend, and went out for the usual Korean BBQ. The evening started off as usual with Sejun and I strolling the streets with a brew. He informed me that although it is perfectly legal he cannot do it alone. I can, foreigners can, but if he were to drink on the street alone or with other Koreans it would be highly frowned upon. Another tradition he gets to avoid with us is being required to order food whenever you sit down at a table. Most places won’t let you simply drink; everyone has to order food too. That standard changes for foreigners so when he comes out with us we usually only need 1 dish for the whole table but, I digress. 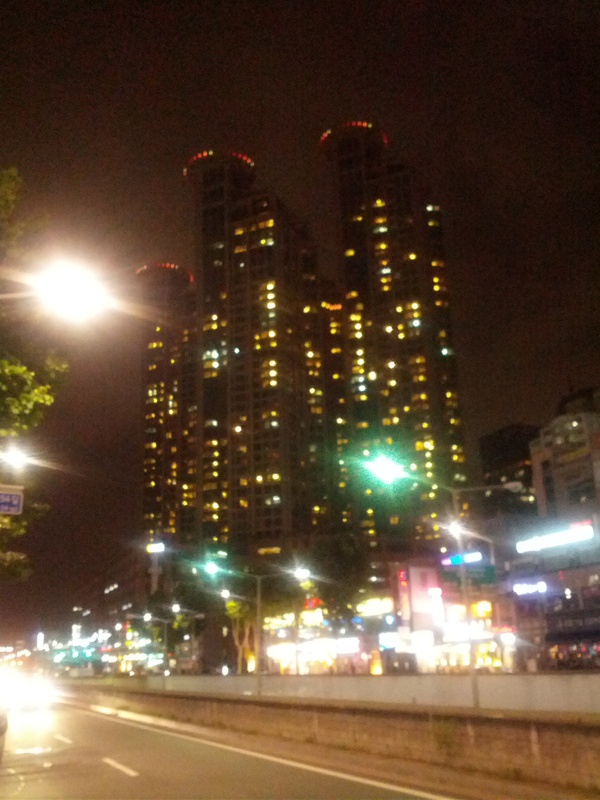 We met my coworker’ Sara, her brother Angelo and his friend Jack near the Hyperion Towers and the Omokgyo subway stop. They had just gotten off of a 17 hour flight from the states and were excited to get the taste of inflight meals out of their mouth. Sejun insisted that we have beef sushi; we didn’t quite know what it was but of course were ready to try something new. We ordered some pork too and the banchan (sides) quickly arrived. We tacked on a few beers and soju to the order, taught the newcomers “ganbei” (a Korean toast) and started to get to know each other. Moments later our food arrived; we didn’t realize the beef sushi was in fact nothing like sushi. It was ground beef with all kinds of seasonings (I recognized oil & garlic but can’t say what else was in it) with an egg yolk in the middle. Sejun mixed it all up and we dug in; it was delicious! At this restaurant we were given the scissors and tongs and had to do all of the grilling ourselves. At some BBQ places the wait staff will cut and flip it for you here we did all the grilling. 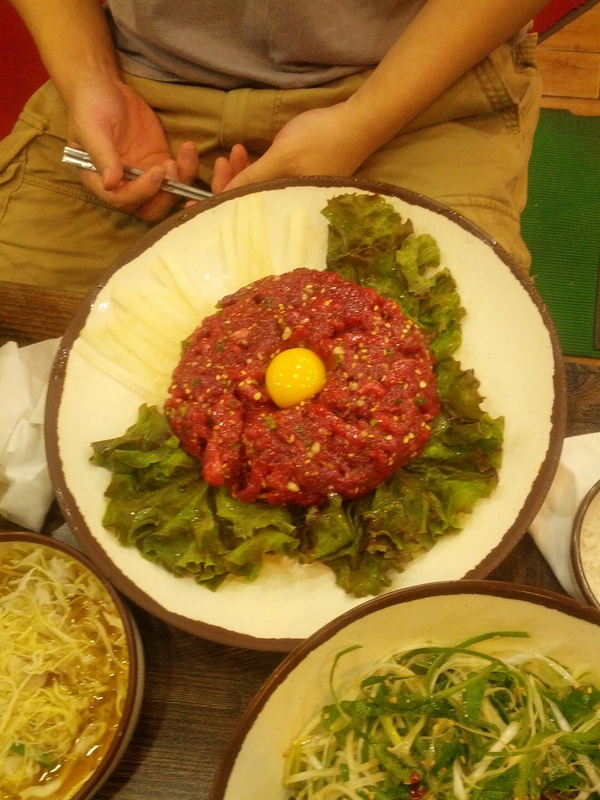 We ate the meal traditionally by wrapping the meat, some red paste, sprouts, garlic and whatever else we wanted in a lettuce leaf. The oils dripped out and made a mess for most of us while one of the newbies struggled with chopsticks. Sejun seemed to be the only one that didn’t have trouble but we certainly all enjoyed it. The smells coming from the grill kept you hungry the whole meal and we devoured the rest of our order.